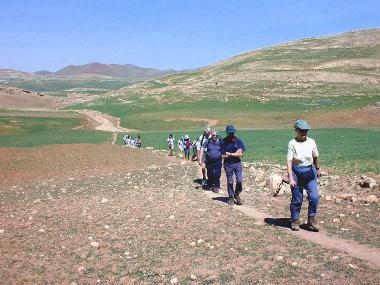 Of all winter walking possibilities, Marrakech and the surrounding High Atlas mountains are perhaps the most enticing. Just three hours’ flight from the UK (with no time difference) and you’ll be pulling on your boots for a couple of days trekking among friendly, self- sufficient Berber communities and extraordinary scenery. Mohamed Ben brahim, an English-speaking guide based in High Atlas who has been leading tours in Morocco for ten years, sums up the attractions: “Timeless adobe villages, the warmest welcomes, and a panorama from the summit that overlooks the Sahara, a desert larger than Australia. It’s worth every effort.” Some of the world’s best treks are in the High Atlas but there are many options for short three-to-four- day trips, including summiting Morocco ‘s highest mountain, rather than epic expeditions. 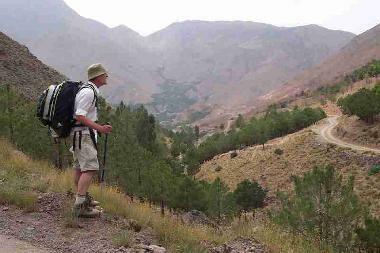 From Marrakech head to a lively village called Imlil, the trailhead for the Toubkal area. From Imlil it’s a 45 minutes walk to an overnight stay in the Aremd village, efficiently run according to Gite de tap rules. At daybreak, or earlier, start the last 2,300-metre climb to the summit of Jebel Toubkal . Rather than this direct route to the top of Toubkal, you may prefer to explore Ourika Valley , Amizmiz valley, walking past Oukaimeden to Tizi n’Addi, a pass.